Open 7 days a week, lunch and dinner. 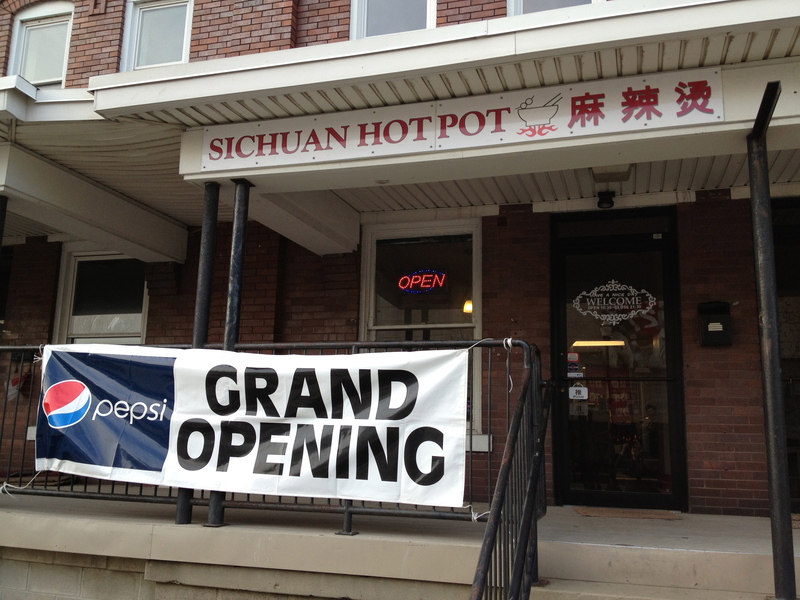 Sichuan Hotpot is the latest addition to the campus area’s lineup of Chinese restaurants. 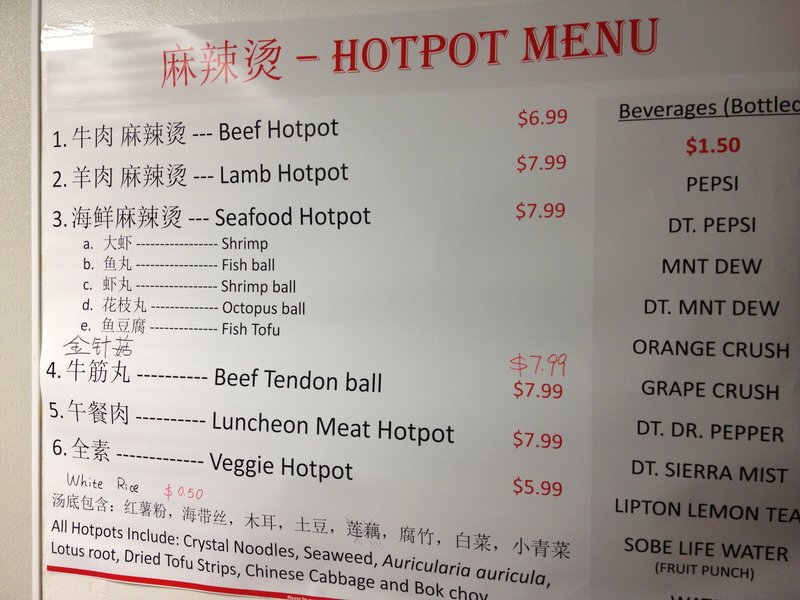 Located in a tiny walk-up space on Chittenden Avenue that seats around 24 people, the owners have opted to provide a small, focused menu based upon, as their name suggests, hot pot. No General Tso’s, no orange chicken, just steamy, brothy noodle stew served with this disclaimer; ‘please be aware all hotpots are hot and spicy and may cause discomfort in some individuals’. All of the hot pots at Sichuan Hotpot include cellophane noodles (made from mung beans), seaweed, wood ear mushrooms (auricularia auricula), lotus root, dried beancurd skin, Chinese cabbage and bok choy. From that starting point, you can choose your protein (or a vegetarian option). There are 10 hot pot options in total: beef, lamb, shrimp, fish ball, shrimp ball, octopus ball, fish tofu, beef tendon ball, luncheon meat (aka spam) and veggie. All are priced between $5.99-7.99, and you can add additional proteins or enoki mushrooms for $1 each. Among our group of five, the favorites were the beef tendon ball (think flavorful meatball) and lamb (very lamb-y), with a couple of votes for the fish tofu (think mild fish cake) and the luncheon meat. The broth was very flavorful and would probably be classed as a medium spice level – additional chili sauce is available. Temperature-wise, all of our hot pots came to the table steaming and seemed to retain their heat surprisingly well. One bowl makes for a reasonably substantial meal. There are a few sides/appetizers to snack on while you wait for your hot pot to cool down: crunchy fried chicken, chinese cruller, spring roll and glazed crispy mantou (deep-fried Chinese steamed buns). The chicken was a little more greasy than crispy although the flavor was good, the spring roll was fine but not especially memorable and the mantou, served with a sweet glaze, could almost be a dessert. The cruller is light and crispy and works well dunked into the hot pot. The last (untranslated) item on the sides menu is a sweet Chinese herbal ice tea. 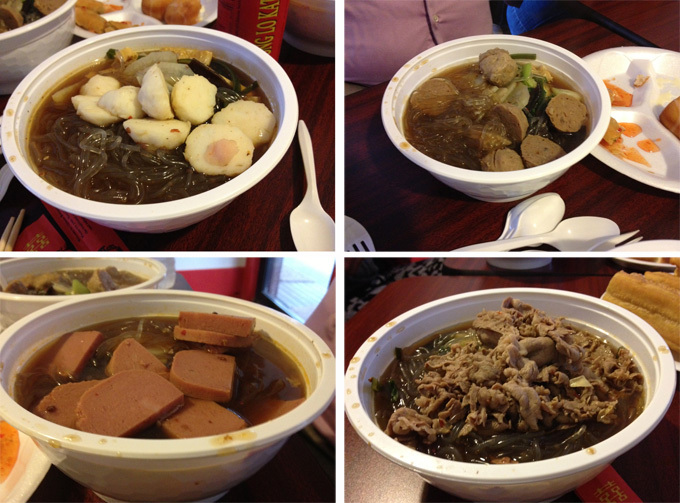 For those in the campus area Sichuan Hotpot is a nice additional takeout lunch option. Just tried Hotpot for lunch today. Got the beef tendon ball. Like you said, very flavorful and it held the heat well. The medium spice really built up after a while – great for clearing out the sinuses on a chilly day. I must admit a massive disappointment in this restaurant. I’ve eaten Sichuan hot pot around the world, and it’s always cooked and served in the middle of the table, and often comes with meat that can be cooked by the diner. 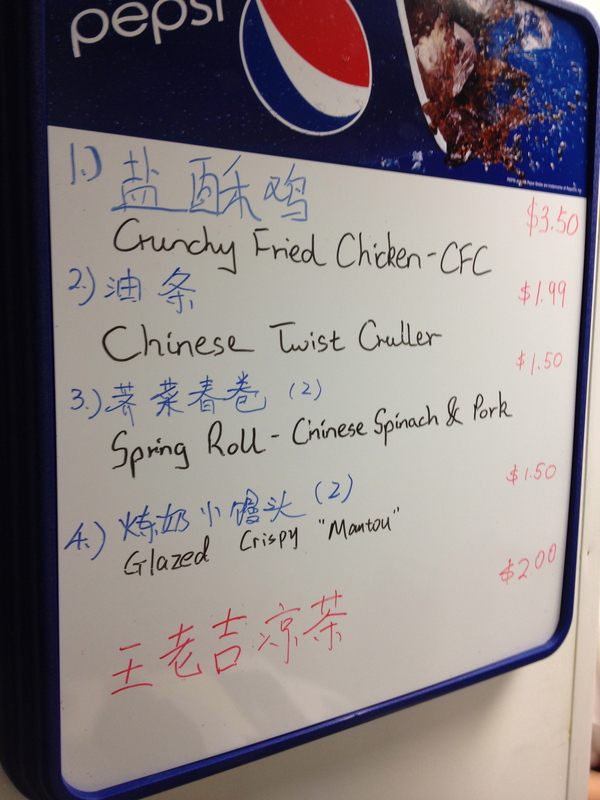 So, while the soup at this place is fine, it is most definitely NOT sichuan hot pot. Sigh. And I was so excited when I saw the sign! For what it is, it’s okay. The soup is fine. Lastly (and I know this sounds like a niggling complaint), but I really wish they’d upgrade to reusable plastic bowls, spoons and perhaps chopsticks. Perhaps there’s no room for a dishwasher, but there’s something unsettling and unsatisfying about eating a huge bowl of hot soup with implements that feel like they’re going to give way at any minute. This was especially problematic when I asked them for extra bowls so we could share, and they gave us small, wax paper boats which dissolved in about a minute, leaving a huge mess on the table and our hands. I love the idea of a Chinese soup restaurant. But to bill it as Sichuan hot pot is pretty depressing. Stopped by there last week. Unfortunately, there was sign on the door saying they are closed until June 3. Save yourself the trip until after then. We really enjoyed both the beef and lamb hotpots. They are really temperature hot and they are also just right spicy hot. I would recommend them highly but its not like I have eaten Beijing hotpots. I did have something called a hotpot at Jui Thai Asian Cafe but I much preferred their Biang Biang Noodles and preferred Sichuan Hotpot’s soup by far. We did ask Sichuan Hotpots and they said that these hotpots were Shaolin style. We tried to go back but they were closed until mid June. I don’t know if I can wait!